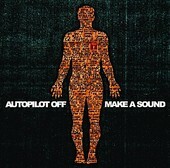 On their latest, Autopilot Off indeed Make A Sound, a catchy, melodic, sing-along sound that still has balls and force. Whether its the tender, pop-laden "I Know You're Waiting", or the hook-filled modern rocker "Make A Sound", Autopilot Off combine strong pop sensibilities with hard-hitting, crunchy modern rock entangled with punk and hard rock influences nestled behind the songs. "What I Want" is a made-for-radio hard-hitter, while "Divine Intervention" even showcases a bit of an emo side to the band. Encompassing plenty of modern rock sounds, Autopilot Off transforms them into one balanced, rocking, and easily melodic blast of energy that should be tearing up the airwaves. Even if you don't like the band, you can't help but sing along to these overly infectious songs. I'll give it a B.